Learnball League is a teacher-to-teacher, self-help network that supports teachers who use Learnball. The League calls and visits members to gather information in order to regularly revise and update Learnball manuals. The League also maintains a telephone hotline and email assistance to provide advice, operates this web page, and furnishes members with an annual registration certificate. Finally, the League provides financial aid and technical support to teachers who sponsor an academic event known as a Learnball Tournament. The Tournament, held outside the classroom, boosts student participation inside the classroom. Learnball League International began as a nonprofit network of teachers who helped Bradley by giving him suggestions for the improvement of Learnball. He soon came to see, however, that the Learnball peer norm within his own classroom was strengthened when his students learned that many other students and teachers were also using Learnball in precisely the same manner each day. Consequently, Learnball League International today performs dual functions. It helps teachers implement Learnball, but it also gives students a sense of membership in a very large peer organization. Today, the League gives students a sense of worldwide generational peer bonding. That, in turn, produces much greater motivation, discipline, and self-esteem than is possible when team membership is limited to just one classroom. For example, having The Learnball Classroom Guide prominently displayed at all times is a reminder to students that they are united with others who also faithfully follow Learnball contest rules. It tells them that they are literally "going by the book" and that the process is standardized for everyone. The official ball, Learnball League registration certificate posted on the bulletin board, and Learnball merit award certificates tie students to their peers worldwide and reminds them that others find Learnball an exciting and enjoyable way to learn. Learnball League also provides teachers with a support group. It gives advice and helps them to present Learnball at inservice and other professional gatherings. This unique teacher-to-teacher aspect of the League has received special recognition in the Association of Supervision and Curriculum Development journal, Educational Leadership. In an article entitled "Learnball League: Teacher-to-Teacher Staff Development," the League was described as a "teacher-to-teacher, self-help network that gives support to teachers through a telephone hotline and email. The article credited the League for recognizing that teachers are more likely to succeed with a new program when there is an organization that "provides support from peers." It noted that Bradley had the foresight to establish the League long before the importance of peer support was recognized. It said Bradley was correct in his assessment that the teacher is the key to implementation of any new program. Finally, the article concluded that "Dr. Bradley developed a dissemination model that meets today's standards for staff development presentations." Bradley and League staff members have traditionally kept a low profile and do not seek publicity. The spotlight is placed on members in the field. Consequently, members are encouraged to highlight their Learnball success stories as a guiding light to other teachers desiring help. 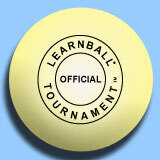 The League gives suggestions and advice on presenting Learnball at inservice or other professional gatherings. Send an email or call the League.